"I have no dress except the one I wear every day. If you are going to be kind enough to give me one, please let it be practical and dark so that I can put it on afterwards to go to the laboratory", said Marie Curie about her wedding dress. According to her lecture notes, Gertrude B. Elion is quoted a few decades later: "Don't be afraid of hard work. Don't let others discourage you, or tell you that you can't do it. In my day I was told women didn't go into chemistry. I saw no reason why we couldn't." These two quotations from famous, Nobel Prize winning chemists amply demonstrate the challenges that female scientists in the past centuries have had to overcome; challenges that are still sometimes faced by the current generation. They "must have the noblest courage, quite extraordinary talents and superior genius" wrote Carl Friedrich Gauss 1807 in a letter to mathematician Sophie Germain. 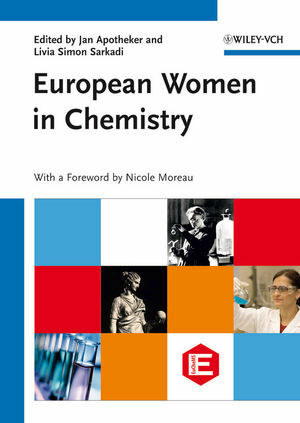 For the official book to celebrate the International Year of Chemistry, the European Association for Chemical and Molecular Sciences (EuCheMS) has chosen one of the central goals of the International Year: the contribution and role of women in chemistry. This celebration, which is the focus of European Women in Chemistry, takes us on a journey through centuries of chemical research, focusing on the lives of those amazing women from ancient times to the current day who dared to study this subject, often against advice or societal expectations. These portraits emphasize the extraordinary path and personality of these fascinating women, their major contribution to chemistry, but all in the context of their time and social environment. Some of these women, like Marie Curie and Dorothy Crowfoot Hodgkin, are famous and still well-known today. Others have contributed significantly to the development of science and lived an exceptional life, but are nowadays almost forgotten. This book is a tribute to all of them and a motivation for new generations to come to tread new paths, fight for unusual ideas and control one?s own destiny. Jan Apotheker is a lecturer in Chemistry Education at the University of Groningen. After obtaining his academic degrees from the University of Groningen in Biochemistry, he taught chemistry at a local secondary school for 25 years. One of his prime responsibilities as lecturer is the training of teachers in all levels of education. He is also involved in the organization of outreach activities both from the university and on a national scale. He is a member of the steering committee 'New Chemistry' that is currently developing a new chemistry curriculum for secondary education in the Netherlands. Jan is the Royal Dutch Chemical Society board member for education, an IUPAC Committee Member for chemistry education, and a member of the EUCHEMS division for chemistry education. Livia Simon Sarkadi is a Professor of Applied Biotechnology and Food Science at the Budapest University of Technology and Economics, Hungary. Since 1980, she has taught biochemistry, food chemistry, and food analysis. She has supervised a number of PhD, BSc and MSc students. Besides being an author and co-author of many scientific papers, she wrote a textbook on Biochemistry. She is a member of the Editorial Board of International Journals (European Food Research and Technology, Food and Nutrition Research). She has been the Chair of the Food Protein Working Group of the Hungarian Academy of Sciences since 1996 and is currently the Chair of the EuCheMS Food Chemistry Division, and an elected member of the EuCheMS Executive Board.